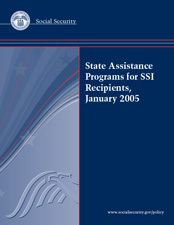 This report provides data on selected characteristics of state assistance programs for Supplemental Security Income (SSI) recipients as of January 1, 2005. The programs are state supplementation of federal SSI payments (mandatory and optional), state assistance for special needs, and Medicaid. The characteristics selected for each program are those about which the Social Security Administration (SSA) receives questions most often from individuals, public and private organizations, and federal and state agencies. The program details are explained in the "Guide to Reading the State Summaries."